Council Crest…Glass Hill…Talbot’s Mountain…Fairmont… Dreamland. All names that described the high point above Portland atop the West Hills. Of them, Council Crest is the best known, Talbot’s Mountain the most legitimate. But Dreamland, the most appropriate. The site of today’s Council Crest Park was part of John and Sarah Talbot’s 640 acre Donation land claim, established in 1850, which overlooked the small town on the Willamette, two miles away and over a thousand feet below. The woods above Portland were so impassable that upon their arrival, the Talbots, their two children and all their possessions had to boat up river to near Johns Landing to begin a three day ascent to reach their new homestead from the east. At the high point of the land claim they cut a clearing and built a cabin and a small windmill, as if a tiny piece of Kansas had dropped down on a mountain top surrounded by old growth forest. They had two more children. The youngest, Ella Talbot, would attract notice by racing every day down the steep wooded trails on a small black pony to school at St Helen’s Hall, (a “boarding and day school for young women and girls”) located where City Hall is today. The dreamer of the family was her brother, Charles B. Talbot, a sort of backwoods Tom Swift, who was said to have invented the typewriter and the sewing machine in isolation at the homestead. Later, in his early twenties, he was rumored to have conceived the idea of bringing Bull Run water to Portland, an idea quickly appropriated by others “without so much as a thank you to the boy benefactor.” He died in 1900 “a disappointed man having lived so much ahead of his time in point of intellect as to be wholly unappreciated for what he was by those with whom he came in contact.” (The Oregonian, January 6, 1907). Looking south on Council Crest towards Raleigh Hills (center) and Beaverton (to the right). Publisher George H. Himes was the apostle of Council Crest. -George H. Himes, in The Oregonian, September 16, 1906. George Himes guided many people up to share the view, some with national stature such as cartoonist Thomas Nast and poet Joaquin Miller. On the evening of July 12, 1898 he was there with a national council of Congregationalist Ministers. As the sun set behind the Coast Range it was suggested that a fitting name should be given by the group to their meeting place. Himes, struck by romantic fancy, related the site had been used by Native Americans as a “council ground” and that signal fires were once lit to there warn of impending danger. To the council of ministers the historic symmetry was irresistible. Thus the name Council Crest was born, a bitter point of contention for Talbot partisans for years to come. 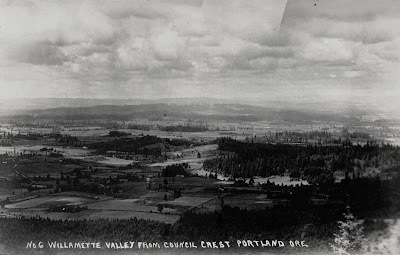 Downtown Portland and the West Hills, also known as the Tualatin Mountains, circa 1900. "Big Tree", also known as the Lewis & Clark observatory. -Courtesy of Mark Moore, PDXhistory.com. Later known as “Big Tree,” it was destroyed by a lightning strike. 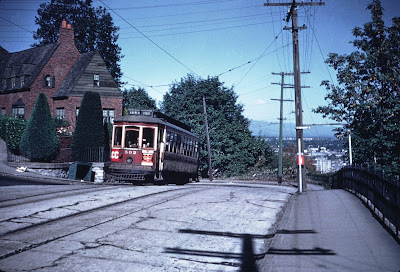 A car on the Council Crest line climbs Vista Avenue in 1949. 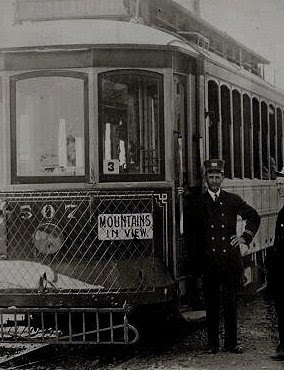 In 1906 the Portland Railway’s Portland Heights Streetcar line reached Council Crest. Because of the steepness of the grades up Vista Avenue, the ten cars built for the line were equipped with electro-magnetic brakes. 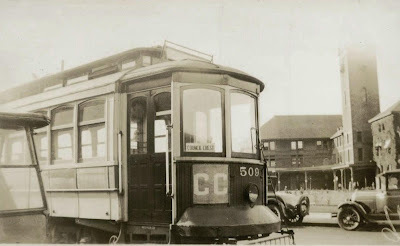 Six of the cars remained in service on the line all the way to 1950 when the Council Crest line was abandoned at the end of streetcar service. Car #502 on the Council Crest line near SW Montgomery Drive in 1949. Much of Tri Met’s Route #51 still follows the original streetcar route to Council Crest. Until the 1930s the Council Crest line ran to Union Station on Fifth Avenue, then the line was re-routed to loop on Washington and Morrison at Fifth. Pictures of the Council Crest cars and Union Station are a rarity but a similar view, using the Portland Vintage Trolley replicas of the Council Crest cars, will be possible when the Max line up the transit mall on Fifth and Sixth opens in 2009. The streetcar line brought with it new ideas on how to best take advantage of Portland’s high point. 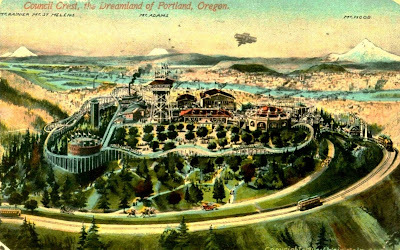 A tourist hotel “with an excellent view of the city in one direction and the Willamette Valley in the other” was planned to begin construction in 1907. Instead, an amusement park was built. 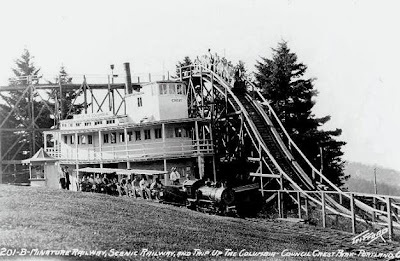 In the early 1900s it was common for streetcar/utility companies to place attractions such as amusement parks at various end points on their systems to generate ridership on lightly traveled commuter-free weekend days. Amazingly, like the coelacanth, one still survives; Portland’s own Oaks Park. 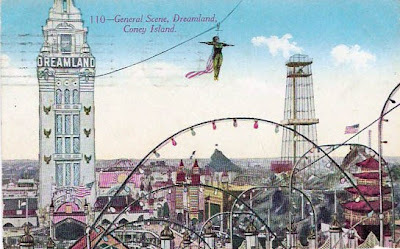 The name “Dreamland” was used to invite comparison with New York City’s Dreamland amusement park, which, along with Luna Park and Steeplechase Park, made Coney Island the amusement park capital of the country. 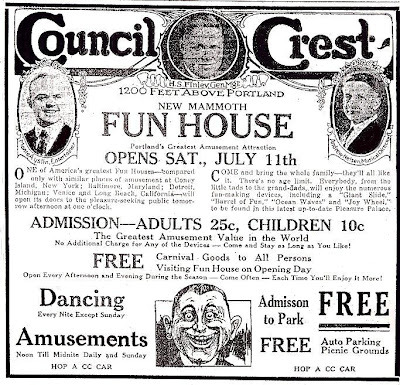 An advertisement by the Finley Amusement Company proclaiming the opening of “a New Mammoth Fun House”. -Courtesy of Mark Moore, PDXhistory.com. 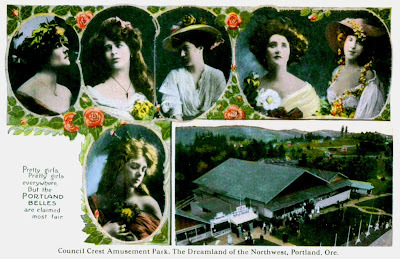 “…but the Portland Belles are claimed most fair” in this postcard featuring the view looking down from the Council Crest observation tower at the rifle range and dance pavilion. The dance pavilion was a scene of controversy, an alleged site of scandal and debauchery, (the exact nature of which was never actually specified in the newspaper accounts) that lead to nearby residents to unsuccessfully lobbying for its closure. -The Oregon Daily Journal May 28, 1910. -The Oregonian, May 17, 1909. With the amusement park came dreams of even grander proportions. In 1909 an “Ideal Road” a boulevard 100 feet wide to encircle the crest was proposed to make the road to Council Crest on of the “most elegant roads in the country.” At the same time momentum was building for a tunnel under Council Crest to allow farmers in the Willamette Valley an easier route into downtown Portland. The idea for the tunnel under the crest remained seriously in play as late as 1925 when Julius L.Meier (son of Meier and Frank founder, later a Governor of Oregon) was chosen to head the “Portland Tunnel Committee.” The group included highwayman J. B. Yeon and members of the Dekum and Wortman families. “Mountains in View.” -Even with the amusement park, the scenery was still the main attraction on Council Crest. At times the city would be under clouds while the crest was in sunshine and vice versa. 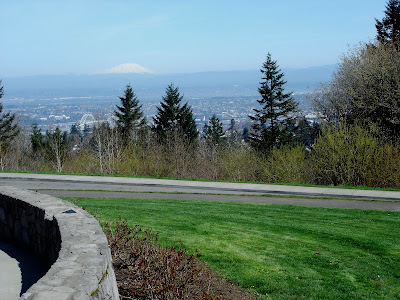 In the early years of the century, it was the responsibility of the Council Crest car crews to post a yellow and black “Mountains in View” sign, if the peaks of the Cascades were visible from Council Crest. Thus down the line on Vista, Burnside, Washington, and Fifth on out to Union Station, Portlanders were treated to a pre-Doppler radar local weather report. On the evening of October 14, 1928 at 7:20, Oregon Governor Isaac Lee Patterson pressed a key from the KGW radio studios inside the old Oregonian Building which lit a 10,000,000 candlepower aircraft beacon that had been placed atop the observation tower on Council Crest. 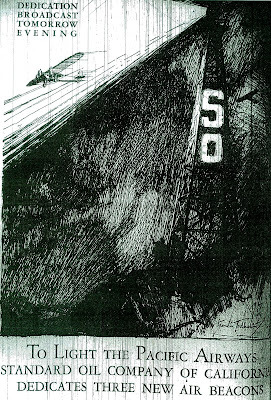 Standard Oil was very interested in the progress of civil aviation as a new outlet for fuel sales. Along with the SO beacon to protect airplanes to and from Portland’s new airport on Swan Island, there were five identical beacons installed on towers along the west coast: SW (Standard-Washington) above Seattle, SD on Mt. Diablo east of San Francisco, SL east of Los Angeles in the Merced Hills and SM above San Diego, as well as a chain of smaller beacons running the length of the Pacific Coast. The amusement park closed in 1929 after half a decade of declining finances. 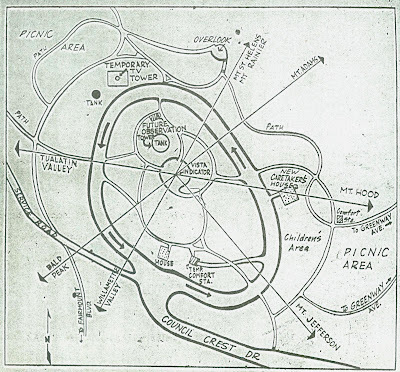 Even so, there was a serious effort to establish a “year round amusement resort,” featuring a new 200 foot art deco styled observation tower, an indoor swimming pool and toboggan and ski slides (?) on the northwest slopes. Instead, as the depression progressed, the abandoned amusement park buildings were gradually cleared, to be replaced by neighborhood vegetable gardens. At dusk, the giant red SO letters would blink on and the beacon would rotate above the decrepit observation tower and the rows of cabbage, lettuce and squash. George H. Himes’s dream came true in 1937 when the top portion of the crest was acquired by the city for use as a park. The following year the Standard Oil beacon was removed due to the condition of the observation tower and the fact that the new airport was further away. 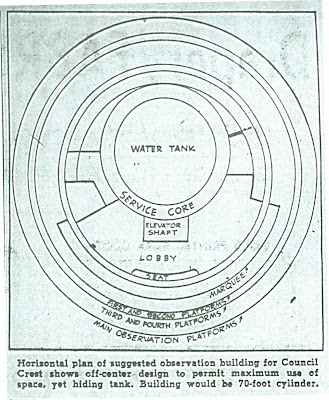 City plans for the park included a new observation tower, an observatory, and (seriously considered) the moving of the Lewis and Clark Forestry Building from the old exposition site in northwest Portland to the top of the crest. 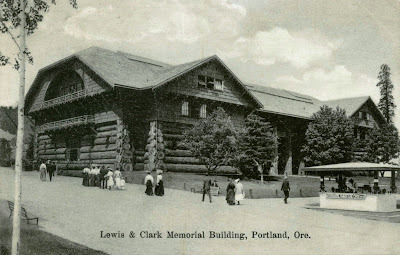 The Lewis & Clark Exposition’s Forestry Building which burnt in 1964. 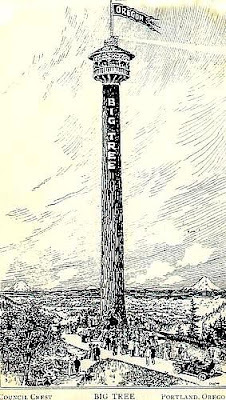 It was made from two miles of five and six foot wide logs, and eight miles of poles. To have moved it from its location near today’s Montgomery Park to Council Crest would have been a titanic undertaking. On December 12, 1941 the old observation tower was finally pulled down, its condition so bad as to eliminate its consideration for even wartime contingencies. 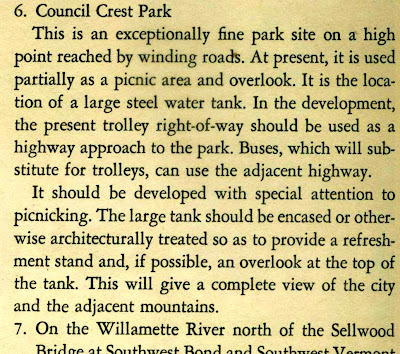 Robert Moses’s take on Council Crest Park from the 1944 “Portland Improvement” report. It features a new observation deck above the water tower and, that favorite of all Moses accoutrements, a highway. The dream of an observation tower above Portland appeared one last time in 1952 when it was suggested that a common antenna for all future television and radio stations be built on Council Crest. The tower would be built around the existing water tank. The city hoped that by charging fees for its use, the massive antenna and transmitting equipment, as well as a restaurant, would pay for itself. With the installation of more antennas around the city, the idea faded from view. Looking like nothing so much as a James Bond villains headquarters, the 1952 tower proposal called for a huge television and radio and microwave antennas, an observation deck, a restaurant as well as radio and television studios. -From the Oregonian, August 24, 1952. The interior of the complex, radiating out from the water tank and service core. ...On reaching the crest he stood for a long time without saying a word. -The poet Joaquin Miller to George Himes, from the Oregonian, June 16 1896. The view from Council Crest is still impressive, but less so than it was in the logged-over 1890s when George H. Himes and Joaquin Miller surveyed the countryside from the summit. Trees are slowly obscuring large portions of the view, much of downtown is obscured and a good deal of North Portland is visible only through branches in the winter. The grand vista however still exists, just seventy five feet above the ground where the water tank sits on the site of the old amusement park observation tower. Higher still, the spectacle increases exponentially. 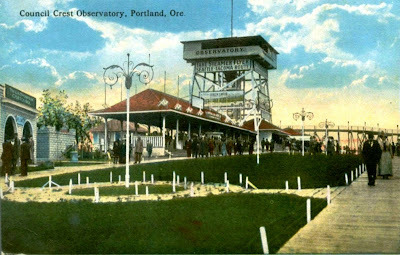 A new observation tower would return to Portland the spectacular view we forgot we once had. It could be as simple as a frame built around the existent water tank topped by a platform, or something more impressive- but it would be pointless to design a building to outshine the views to surround it. A dream? Perhaps, but certainly one less an extravagant one than water from Bull Run, an amusement park, a resort hotel, a hollowed out tree with an elevator in it, or a tunnel under the Tualatin Mountains. It was, after all, Dreamland. -The Oregonian, March 23, 1937. 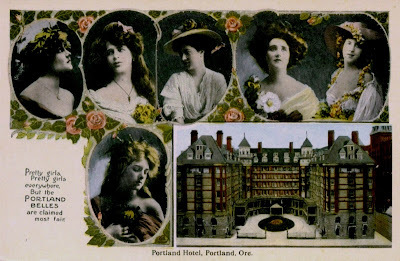 Besides the one for Council Crest, the acclaimed belles of Portland appeared on postcards promoting the Portland Hotel (the former Hotel Portland), the Multnomah Hotel and the Lewis & Clark Forestry Building. Were there others? More than 30,000 motors crossed Hawthorne Bridge daily before it was closed for reconstruction incident to the Front Avenue project. Many of the 30,000 crossed at morning and evening rush hours. Now the Ross Island and Morrison Bridges get the load. The steps by traffic authorities to keep cars and trucks moving and to prevent jams deserve al commendation. Let’s just be sure the remedies are strong enough. For instance, the plans for the west Ross Island bridge approach might be augmented by devoting three lanes to westbound traffic in morning rush hours, and vice versa for eastbound traffic in the evening rush hours. Helping the incompetent old Morrison Bridge is far more difficult. Perhaps a three-way approach plan suggested long ago is still good. With the great recent increase of traffic –gasoline consumption is locally 25 per cent greater –Portland people can only be sorry the lacked the foresight to build the Fremont (Interstate Avenue) Bridge- or to have place so fine a span as the St. Johns Bridge at a place where it would best serve even the St. Johns and Peninsula traffic. “The past is not dead. In fact, it’s not even past.” -William Faulkner. 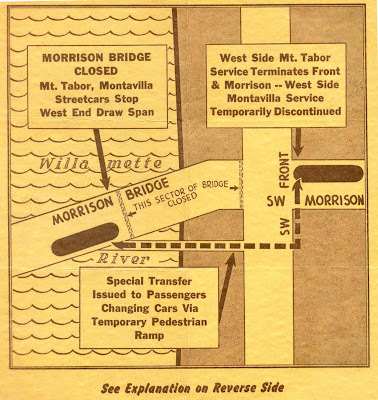 A Portland Traction plan for bridge work on the old Morrison Bridge, circa 1944. I have broken your code Sir!